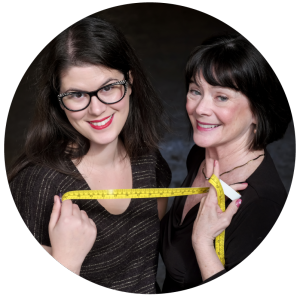 SewHere is the latest expression of Zede and Mallory Donohue’s passion for sewing. After running a successful sewing machine dealership for 11 years, Zede and Mallory decided to follow the winds of change and follow their main passion- creating sewing media. Zede and Mallory host the weekly podcast “Sewing Out Loud” where they discuss sewing techniques, pet peeves, and often feel free to compliment one another on their makes. Mallory records three Facebook Live broadcasts each week in the Self Sewn Wardrobe Facebook group and publishes the audio as “The Self Sewn Wardrobe” podcast. Zede and Mallory are available for in-store appearances and classes. Their nation-wide audience of stitchers trust the advice they give on materials, machines, and patterns they recommend. Visit the Book Us page for more info! Hello: I recently purchased the Rhapso T pattern. I have also reviewed the 3 video tutorials. How much fabric does one need to make the Rhapso T? Also, is there a synopsis somewhere that hits the key points of the 3 videos so as not to have to rewatch all 3 again to find out the key info? Thanks! Hi ladies. I love listening to your podcast. I’ve been binge listening since I found it (Sewing Out Loud) and am nearly up to current. I’ll be sad not to hang out with you daily once I’m caught up. I went to the website looking for the snap and slide measuring tape and I see the shop is sold out. When I search for it in a search engine I just wind up back at your shop. Would you kindly direct me to a source for this item? Thank you for all the laughs and learning you’ve provided so far. I really enjoy the affection and camaraderie you share! Hello! I just wanted to let you know that I recently discovered your podcast and I LOVE IT!!!! Everyday on my way to work and back I listen to you and I really enjoy it, it is a lot of fun. I have learned a lot so far. Thanks from Puerto Rico! !